I wanted to go and see this movie on the big screen but then I didn’t, so I just managed to catch up with it a few days ago. It was exciting for me to see Peter Jackson and his gang coming back with something visionary, something spectacular, a steampunk sarabanda that seemed to be Howl’s moving Castle under steroids. I knew he wasn’t going to direct it and I’m always skeptical when I see big names everywhere and then some unknown guy actually directing the stuff but hey, you can’t always complain, right? Well, it turns out you can. 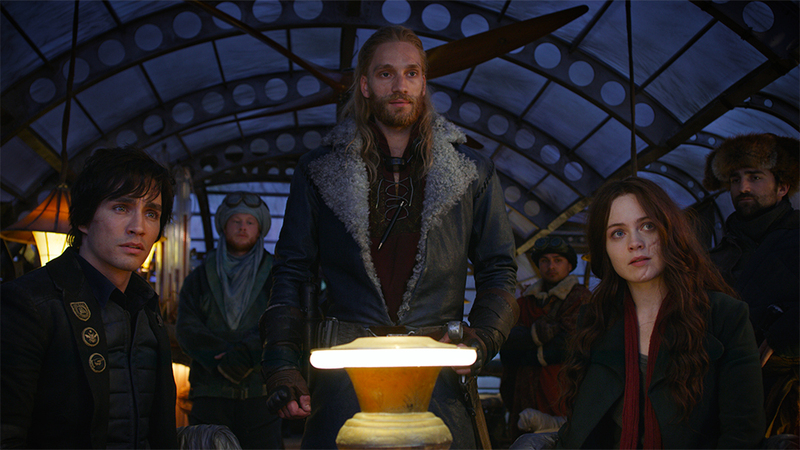 At a first glance, the science-fiction behind Mortal Engines is something along the line of City of Ember (and you might remember how much I liked that one): grand visionary things that leaves you wondering why. The movie also shares some similarities: unknown director, young protagonists with a very soft and shallow love story (Hera Hilmar and Robert Sheehan here, back then it was Saoirse Ronan and Harry Treadaway who you might remember for being Frankenstein in Penny Dreadful some years later), a famous guy playing the villain head of state (Hugo Weaving here, Bill Murray back then). Mind, I’m not saying this movie is a clone. There are striking differences. City of Ember had a giant mole, for instance, and here we have a guy that seems the illegitimate child of the Terminator and Nick Valentine from Fallout 4. I’m just saying it brought back feelings. And not nice ones. 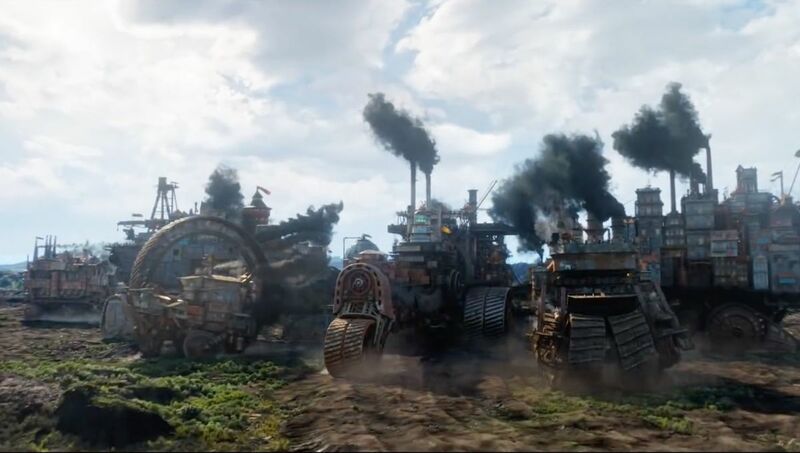 Anyway, Mortal Engines is set in the aftermath of a world war that physically destroyed the face of the world as we know it and spins around this idea that some big cities, in order to face the subsequent crisis, were put on crawlers because they’re more practical, and sent roaming around. London in particular has revived its glorious past and is a pirate city, it goes around capturing smaller villages and… well, this is becoming quite unclear: it dismantles them for fuel in order to go around a little more, earning more mouths to feed. I know. It doesn’t make sense. 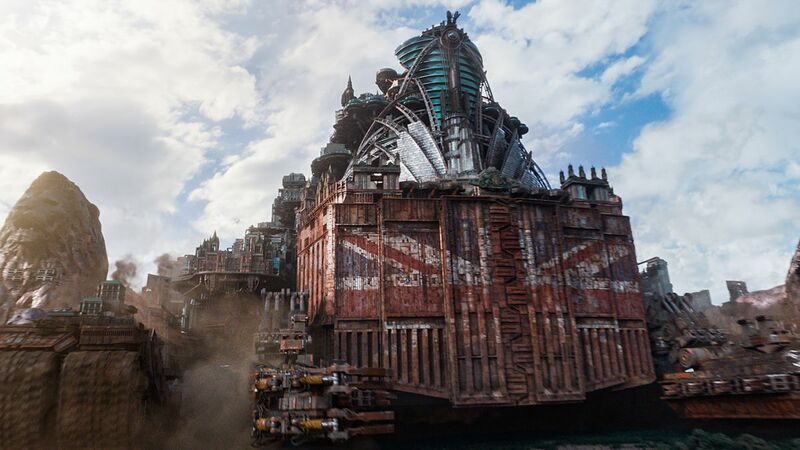 But it does have giant lions and cannons on the side, so I guess it’s ok.
Of course villages are also roaming around, on smaller crawlers, and escape the predator city instead of jumping on board because frankly the lower parts of the moving London don’t seem to be much worse that the outside. Of course technology and science from the old world are super important, because it’s a post-apocalyptic world, and it’s a pity that nobody seems to give a damn except from the protagonist, the villain and Arrow’s foster father. Although I can imagine everybody’s distrust in technology, considering that the most advanced weapon available is a thing whose fail-safe mechanism is a spectacular self destruction. In the midst of all this madness, of course there are things that make even less sense. Scavengers do not scavenge anything, the most practical way to break out a prisoner from a maximum security facility is blowing everything up with a missile. The flying pirates, and I can’t believe I’m about to say this, are supposed to be the sensible ones and instead they live on a floating city where a single spark is enough to burn everything down. Characters are as shallow as they can be. You have a scarred girl (but of course the scar is made in such a way that she isn’t less pretty) portrayed by the girl you might remember as Vanessa Moschella in that awful Da Vinci’s Demons: she’s in search for vengeance, alright, but I don’t understand why everyone is supporting her in it. In the only interesting sequence of the movie, we might argue that her scar was delivered by accident, but of course this doesn’t get explored as an option, so we’re left with an iconic red scarf. And thank God, so we don’t have to endure her facial expressions. You have the useless, weak boy that seems to be necessary for adventures to have a heroine nowadays: we will see Robert Sheehan very soon in the upcoming The Umbrella Academy and I’m not sure whether this makes me more indifferent or even more hostile to that title. You have the villain, of course, which motivations make very little sense and whose action, in order to be villainous beyond doubt, are portrayed as plain stupid. You have the daughter of the villain and it would be a shame if she was portrayed by an actress, so we picked this girl. She’s pretty enough. She’ll do. At her side, for her not to feel alone, there’s an underused not so stupid guy whom relationship with the main boy frankly escapes me: Ronan Raftery has the debatable honor of wearing this character and you’ll see more of him in The Terror. I say “you” because there’s no way in hell I’ll be watching this. Then, we have all the merry pirates of the sky: the Asian, the Indian, the viking. The scavenger on his mechanical scolopendra and his lovely wife. Random people from The Hobbit popping out at every corner. d) crops are growing just on the other side of a wall. If there was some subtle political message here (and I can think of at least one), I missed it. As I seem to have missed the general purpose of the story. It’s a grand vision, don’t get me wrong, but I would appreciate if someone could explain me: the vision of what?